Only One Sophie was seen on Illusion's stage two years ago as part of their "Fresh Inks" series of new works, under the title Walking Across Poland. While that felt like a rough draft with much potential, this feels like a fully fleshed out piece of music-theater. The story is fluid across time and space, but the bulk of it takes place in 1960 St. Paul where a 12-year-old Michael and his family are sitting shiva for his recently deceased grandmother Sophie, as seen through the memories of an adult Michael. As is the custom, stories and memories of the departed are shared, and we flash back to various times in Sophie's life, the audience learning more about her as Michael does. Michael (adult and child versions both played by the versatile Bradley Greenwald) and his sister (Elizabeth Hawkinson) and brother (Benjamin Wagner) struggle against the restrictions of shiva while the adults talk about Sophie. Their mother, Sophie's daughter-in-law (Bonni Allen), remembers their Rosie the Riveter days during World War II. Sophie's brother (Jay Hornbacher) and sister-in-law (Beth Gilleland) recall the early days of immigrant life. Sophie's ex-husband (Randy Schmeling) remembers the good days and the bad of their life together. Through it all, we get to know and love Sophie in the present (Kersten Rodau) and the distant past (Elizabeth Hawkinson), and the legacy she left behind. In a bit of age-blind casting, nearly everyone in the cast plays a character either much older or much younger than they are, but for the most part it works. Most of the characters are seen at various times throughout their lives, and having the same actor play all ages retains the throughline of the character. Bradley Greenwald is especially wonderful at seamlessly transforming from the adult Michael into a quite believable 12-year-old in all his innocence, curiosity, and confusion (except no 12-year-old can sing like that!). The only character played by two actors is Sophie herself, which is an interesting choice, but the transitions are made smoothly so you know it's the same character. Kersten Rodau and Elizabeth Hawkinson illuminate different sides of Sophie, and both have stunning voices. The only missing piece is Michael's father, Sophie's son and the biological link between the two main characters, who goes by the odd nickname of Cutie. I found myself wondering at his absence. Had he died or left the family, or did he just not appear because he had nothing to add to the story? Roberta Carlson's score has a touch of klezmer, and is playful and melodic, allowing these gorgeous voices to shine. She leads the three-piece band (which also includes a cello and my former instrument, the clarinet) on piano. There's no need for the actors to be miked in Illusion's space, so these powerful voices fill the theater without being filtered through a sound system, making for a more natural and organic musical. 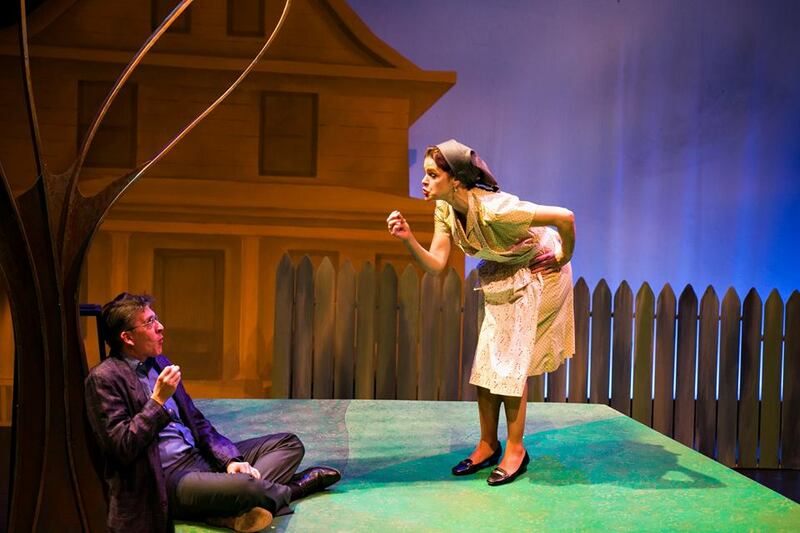 Dean Holzman's set hints at settings both indoors and out, with a childlike appearance appropriate to this memory play, and Michael Wangen's lighting highlights the poignant moments. 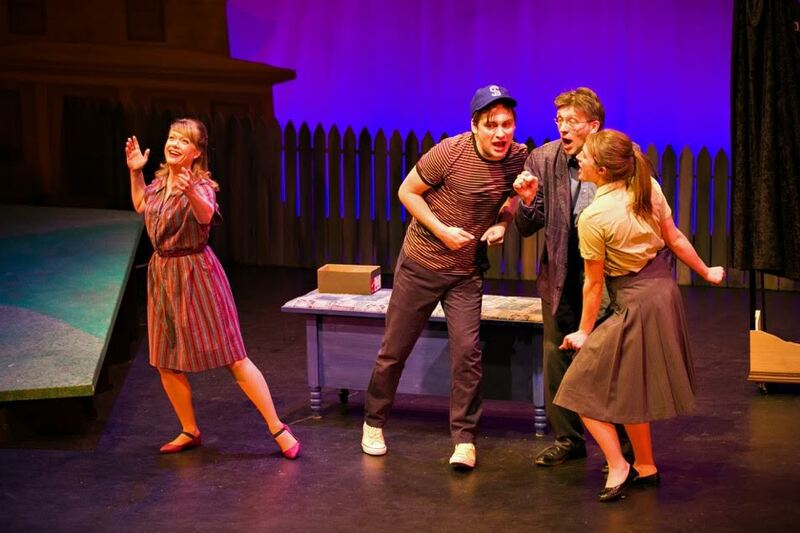 It's obvious that this musical is a labor of love. 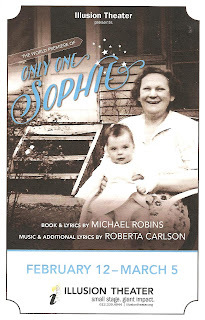 Michael and Roberta have created a beautiful homage to a spirited, strong, loving woman that's also a quintessential American story of working hard to make a better life for your family than the one you left behind. Whenever I go to Illusion I'm astounded that the theater is not more filled than it is; with the quality work they've been producing for 40 years, much of it original, they should have a full house every night! If you've never visited their lovely theater high above Hennepin Avenue, let this be your introduction. Only One Sophie continues at Illusion Theater through March 5 (be sure to check out Goldstar.com for half-price tickets).